I celebrate author and illustrator birthdays to create family memories. The books we read together inspire unique projects, crafts, and family outings. I have found that we can easily recall our experiences when the authors' birthdays come back around years later or when we see the books at the library, a book store, or on our book shelf. This week, to celebrate Brian Wildsmith's birthday I tried not only to create a memory but to preserve a memory. Brian Wildsmith is the author and illustrator of over eighty books for children including Carousel, Pelican, and Professor Noah's Spaceship. He was leaning toward a career in music or science, but decided to follow "an inner voice" to study art. (Books for Keeps, Carey). He recalled, "One morning I was going into a physics class and I remember thinking 'Is this really what I want to do with my life?' and the answer was no. I want to create." (Books for Keeps, Authorgraph 16). Brian Wildsmith listened to his heart and went first to Barnsley School of Art and then Slade School of Fine Art. Later, after time spent in the National Service he became an art teacher, but it really wasn't what he wanted to do. He wanted to paint and create. "I read that 28,000 books a year were published and I thought they'll all need book wrappers, so I spent my evenings designing them." (Independent, 2010). He was a teacher by day and an artist by night. His freelance work led him to Mabel George, at Oxford University Press, who had the idea to put the "artist on the same business footing as the writer." She gave Brian a few projects including four full-color illustrations for Tales from the Arabian Nights (1961) which was not well-received by critics and Brian's art was described as "aimless scribbles...drawings splashed lavishly and untidily with bright smudges of paint." (History of Oxford University Press). Mabel George was undeterred by the critic's remarks and asked Brian Wildsmith to create an ABC book. He created Brian Wildsmith's ABC and described it this way, "The logical function of an ABC is to teach. To teach how? Through basic shapes, colors and textures. It was a new concept: to produce pictures of value in their own right which would stimulate and excite children. And I wanted a new design. Most ABCs say 'A is for Apple.' A is not for apple. A is for A. I wanted this book to say that." (Books for Keeps). Brian Wildsmith's ABC was awarded the Kate Greenaway Medal in 1962. Brian Wildsmith explained the shift this book brought to picture books, "[Before ABC] the text was the most important thing and pictures would just accompany it, diagrammatically explaining what was going on in the words. But I could limit my text so the illustrations explained what actually happened. And not just the physical event of what was happening, but the vision of the people or the animals or the landscape around them. I was expressing in color the wonder and beauty of the world in which we live, which had never happened before, and would have been difficult to explain in words for children." (Independent, 2010). Brian Wildsmith went on to create more picture books; a Mother Goose collection, fables including The Hare and the Tortoise and The Lion and the Rat, and many books about animals, Wild Animals and Fishes. He has sold over 20 million copies of his books worldwide. "From the beginning, what I wanted to do above all for children's literature was to try and span the whole spectrum from an ABC to counting -- through puzzles, myths, nursery rhymes, and stories." (Children's Books and their Creators). "A lot of illustrators have one central character and then they develop it, and all their books are based around it. But that was not my wish. I wanted to introduce children to the whole creative side of many aspects of life." (Independent, 2010). "I use whatever colors I feel like. When I paint a fish, I paint the kind of fish I would like to see. The same is true of my trees. I don't care if they're not the colors in the photographs. I paint what I see with my eyes and feel in my heart." (SGI Quarterly). I wanted to preserve the memory of what it is like to take my young children to church on Sunday; trying to find seats for our large family when we are running late, the large bag of activities and books, their wiggles and need for movement, their curiosity about God, their attempts to sing the songs with the hymnal, "I have to go to the bathroom", our walks in the prayer garden, and the feeling of relief and accomplishment when mass is over and no one has freaked out. As I looked around church this Sunday, most of the families I saw had older children. Someday that will be my family. My young children need a opportunity to get their wiggles out at church. I bring many activities to keep them busy; crayons and paper, books, stickers, but my kids need to move. 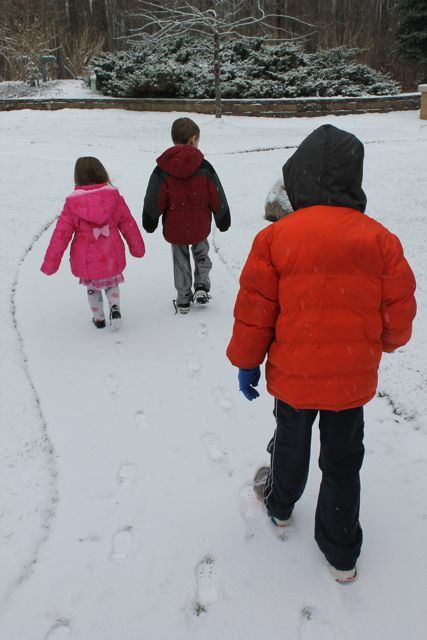 A few years ago, I started taking my children for a walk after Communion. They walk with me in the line for Communion and then we walk to the lobby of the church instead of returning to our place in the pew. When the weather is warm we continue our walk outside in the prayer garden. 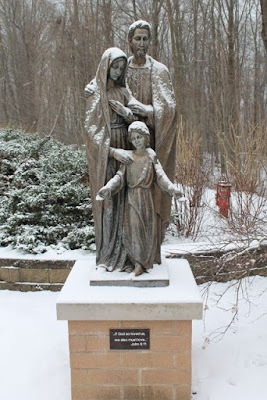 In the prayer garden we stop at the small pond to see if we can see any frogs or tadpoles, then we talk about statue of the Holy Family, and then we say hello to Saint Francis. I remember saying to my children countless times, before they learned it was St. Francis, "Who is that statue of?" I think took it so long for them to learn his name because I had nothing more to offer them besides, "He really liked animals and he was from Assisi." I found Brian Wildsmith's book, Saint Francis at the library and I thought to myself, I am going to read this book and then the next time we take a walk I will be able to tell them something about his life. In the back of the book it states, "Brian Wildsmith's first encounter with St. Francis of Assisi occurred as a young boy, when he was taking his first communion in St. Helen's Church Hoyland, a small mining town in English Midlands. He recalls kneeling at the edge of the altar rails, feeling more embarrassed that the holes in his shoes could be seen by the congregation than terrified at receiving the Host for the first time. And then, looking to his right, he saw a statue of St. Francis, a lamb in his arms and a squirrel perched on his shoulder. There was a look of kindness on his face. His clothes were shabby and drab. He doesn't seem to mind so why should I worry about the soles of my shoes? thought young Wildsmith. St. Francis seemed to say, It's not the soles of your shoes but the soul within your body that I am looking at." The passage went on the say that the statue inspired Brian Wildsmith to take a great interest in St. Francis and later led to large amounts of research and visits to Assisi. I immediately thought about our walks and our St. Francis statue. I thought about how this statue is an important part of our Sunday church experience. 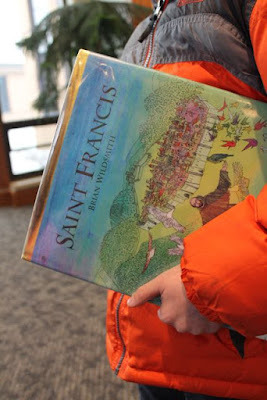 At church this week, I asked my son to carry the book about St. Francis when we went to Communion. He knew right away what it was for. We don't walk through the prayer garden in the winter and instead we hang out the in lobby for a few minutes and then head back into church. But, on this day, we sat on the floor in the lobby while overlooking the prayer garden and the statue and read Saint Francis. We learned that Saint Francis was from Assisi and loved animals, especially birds. We also learned that he grew up in a rich family but chose to live a life among the poor. He rebuilt churches that were falling down, tried to stop people from fighting, got others to live a life of prayer, and had many visions from God. 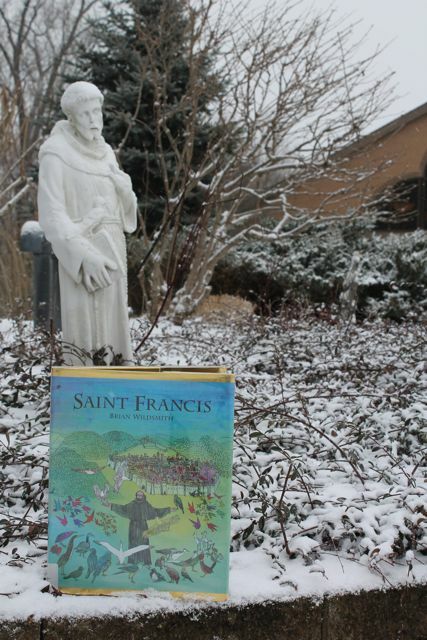 Saint Francis is one of many Christian books by Brian Wildsmith. His others include Mary, Jesus, Exodus, Joseph, and more. 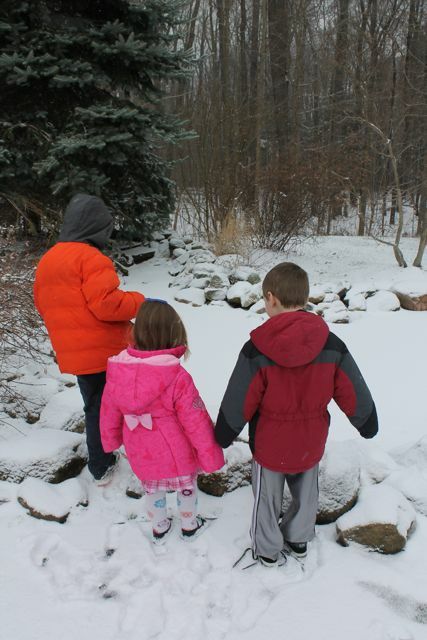 After mass my children wanted to walk through the prayer garden. No frogs or tadpoles to see today. Each time I have to remind them not to step on the rocks. One of these days one of them is going to fall in and we will return to church with wet pants. This is the statue of the Holy Family. On our first walks I asked them, "Who are these people?" Identifying Mary and Jesus was easy. It took them time to learn Joseph's name. 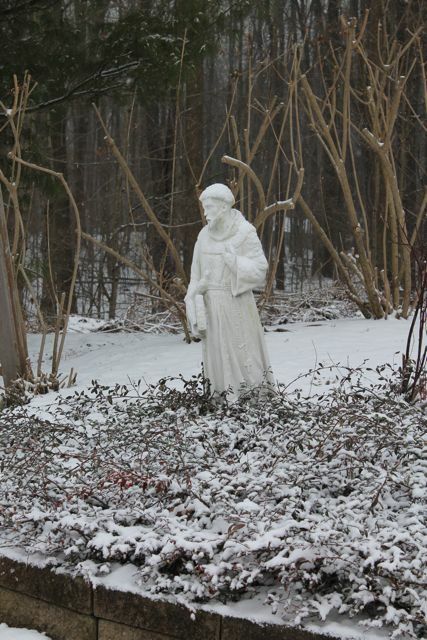 Here is the statue of St. Francis. We had not noticed that a bird sits on the book he is holding until today. In Saint Francis, we heard the story of a time when Saint Francis saw a great flock of birds and told them "God loves you. He has given you wings and beautiful feathers. He has made you free to fly wherever you want. It is your duty to sing to God all day long." This book made me realize the significance of taking my children for a walk during church. After writing this post my memory of this time with my children will be stronger and will stay clear for years to come.